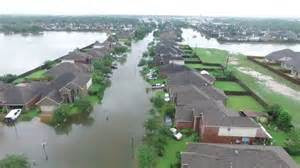 Heartbreaking is the only word I have for what is happening to the good people of Texas, and now Louisana. It goes without saying that our thoughts and prayers are with you. 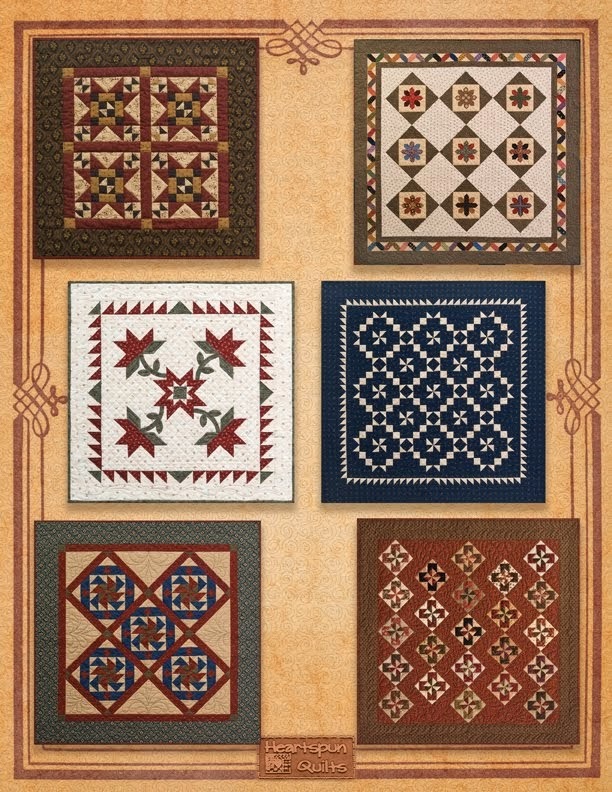 Thinking of all of my quilting friends effected by this terrible storm as I can't imagine what you're all going through. So long as you and your families are safe and together, most things in your life can be replaced. Quilts and fabrics can be washed, sewing machines replaced. A nation of quilters stand with you. If you can, please support the American Red Cross. After my time teaching at Primitives of the Midwest, my hubby and I went onto Kansas City, MO for a day or two of fun. We stayed in the Country Club Plaza district which was just chock full of restaurants and shopping right outside our door. Saturday was the first day of a week long Jazz music celebration. Musicians were playing all over the area and boy were they great! We lingered here a few hours (with a cold beverage) to listen and take it all in. I wanted to get in some antiquing time in if I could. I had heard about the West Bottoms district which was a short 15 minute ride from the hotel. What a fun and unique place to go pickin'! This industrial neighborhood looked like it was abandoned and is now enjoying a new life with antique shops and re-purposed goods stores, along with some new kitschy merchandise. This shop, Nook & Cranny, was my favorite, full of three warehouse floors of antiques! Heaven! I'm not sure if any businesses occupy the top floors of other buildings, but the street level spaces are all occupied. They played oldies music over loud speakers throughout the streets, which was kinda fun, too. You can find anything from architectural pieces to fine furniture, glass ware to textiles and everything in between. My only complaint was the total lack of air conditioning in every industrial shop, but that's just part of the industrial experience, I guess. Honestly, we had a terrific time every day. Great food (especially the BBQ at Jack Stack where we ate twice! ), good weather, lots of things to do and places to shop, all within a short distance. I'm already looking forward to returning there. I hope this gives you just a peek at some fun things to do in KC, MO ~ and don't forget feed your quilting soul at Quilter's Station, too. 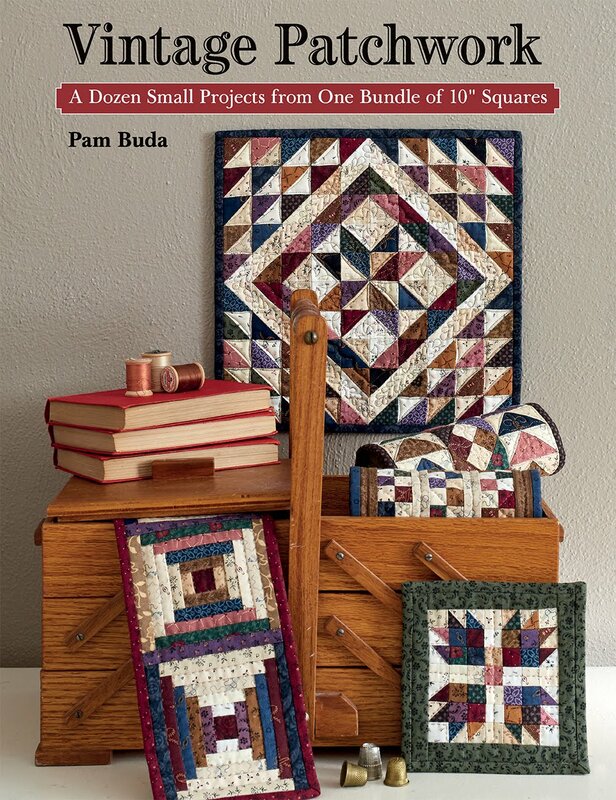 Boy ~ having some time away from home to submerge myself in all things quilting, along with dozens of other kindred spirits sure does a girl a world of good! Primitives of the Midwest was exactly the super fun and inspiring event I knew it would be! Quilter's Station shop owner, Rita Briner, and all the shop girls did a fantastic job of hosting the event. We stayed, and had our classes all in one hotel, which made it very convenient. 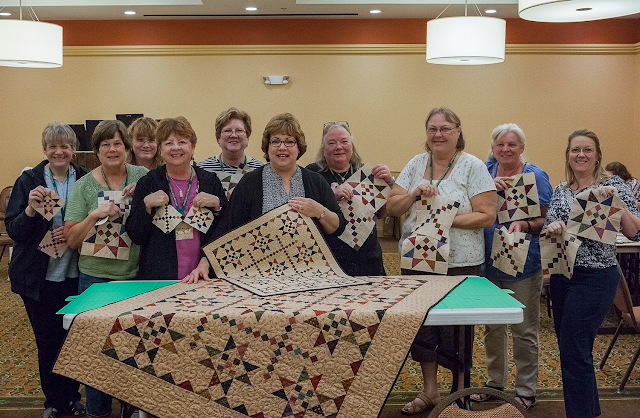 Quilter's from as far away as California, Florida, New Jersey, and Canada (and all points in between) attended. Some brought their machines on the airplane with them, and some borrowed machines. As you can see, nothing stopped them from coming! I had just the best time with my fellow quilters as we talked shop, favorite quilting tools, favorite quilt shops, and shared hints and tips with each other. Always the best day when I get to spend time with other quilters! Quilter's Station Quilt Shop was a mere 5 minute drive from the hotel. Dare I say, most of us went there every day! Just in case we missed something we HAD TO HAVE! Or....if someone bought something, then showed it off, and you discovered you just needed that, too! As you can see ~ there's loads and loads of inspiration everywhere. Everything you'd need for quilting and wool loving are in this shop! Trust me...these few photos don't begin to do the shop justice. It's amazing! I was completely stunned to see two and a half aisles of my fabric in the shop! It kinda choked me up, to tell the truth, to see it all so beautifully displayed. 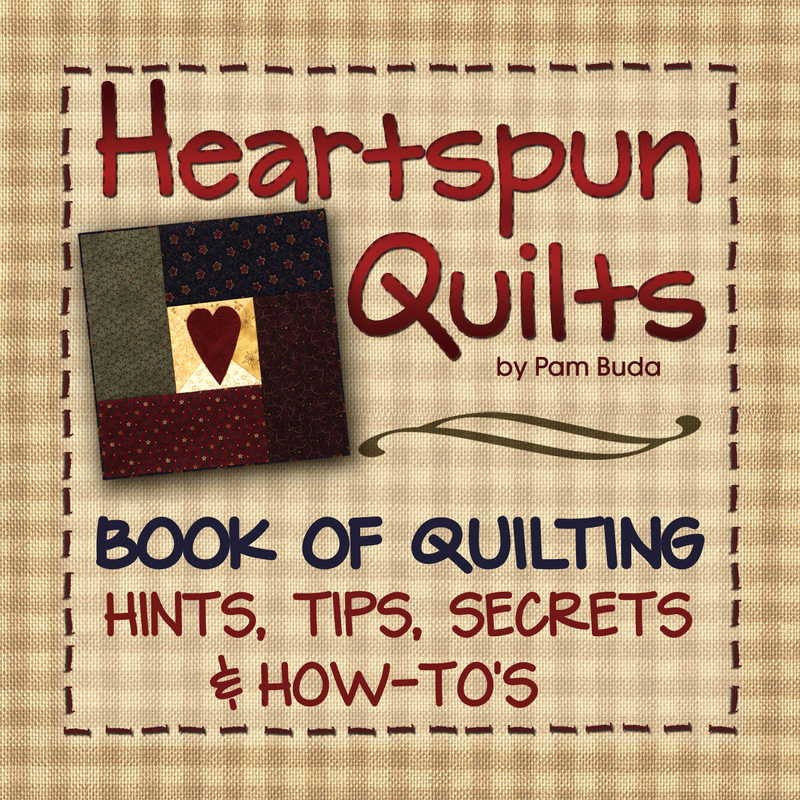 So...if you're looking for Heartspun Quilts fabric....you know exactly where to go and whom to call!!! Quilter's Station. (We have to continue to support our quilt shops!!) 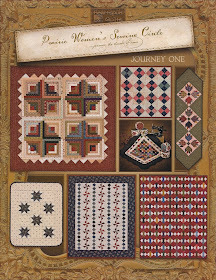 Be sure to add Quilter's Station to your Bucket List as a shop not to miss! I promise, you won't be disappointed!! Hubby and I went to Kansas City for the weekend. We discovered several really fun places and I'll share those with you in my next post. 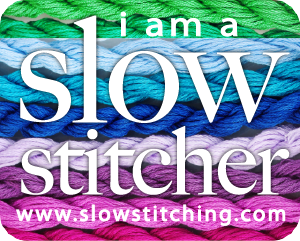 In the meantime....spend some time with needle and thread...and Be Well! Every quilt project begins with the fabric. After choosing (or being possessed to make) a quilt design, the next step is gathering just the perfect fabrics for that quilt. 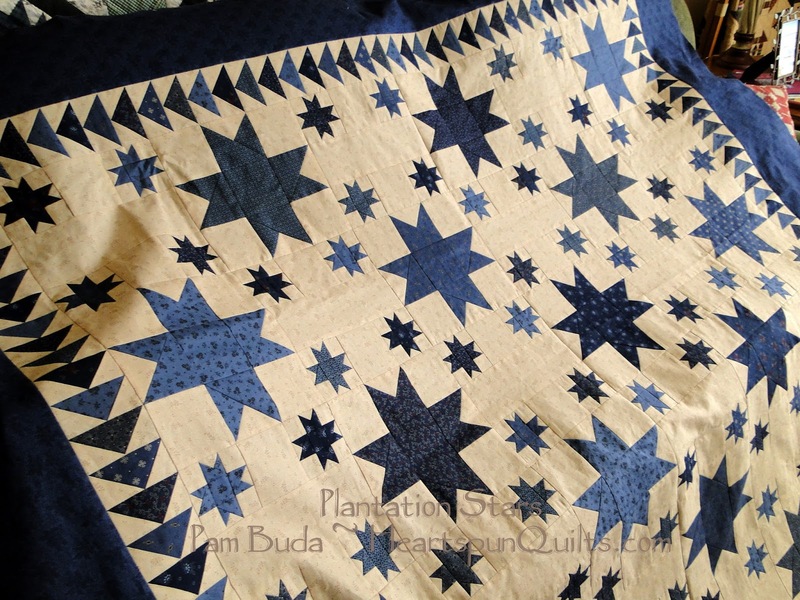 I can not over state the importance of using quilt shop quality fabrics for your quilt. Quilt shop quality fabric simply means the base fabric itself, called greige goods (pronounced gray), are 100% high quality cotton threads in high thread count. You can tell the difference when you hold it up to the light (as compared with chain store fabric), and in the "hand" of the fabric, which means the soft, smooth feel it gives when running your hand across it. AKA petting said fabric. Teehee! I believe this to be a personal preference. I thinking it's fine and dandy if you want to wash your fabric before cutting into it. Personally, I don't wash mine. The reason is that when fabric is milled, sizing is added to it for body, to keep it smooth, and to keep it from wrinkling. 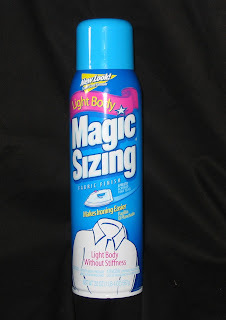 Once I have it at home, I add a lot more sizing or starch (mostly sizing) to make it even more stiff. I am a big believer in sizing fabric!! 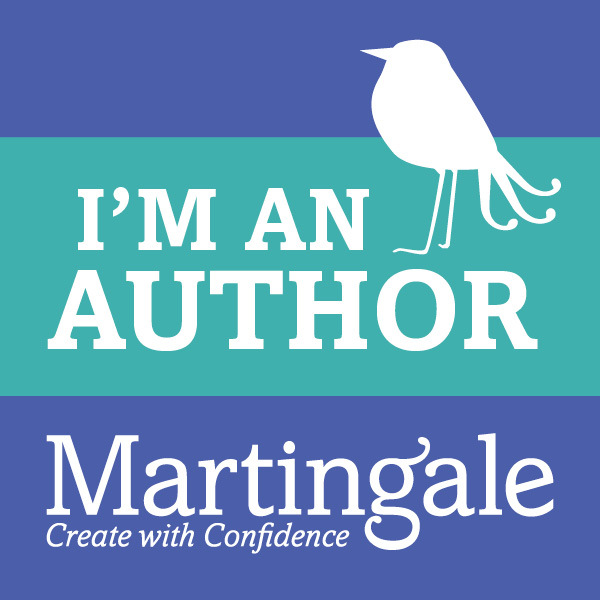 The proof is in the results you get and I feel strongly that it's worth the time. 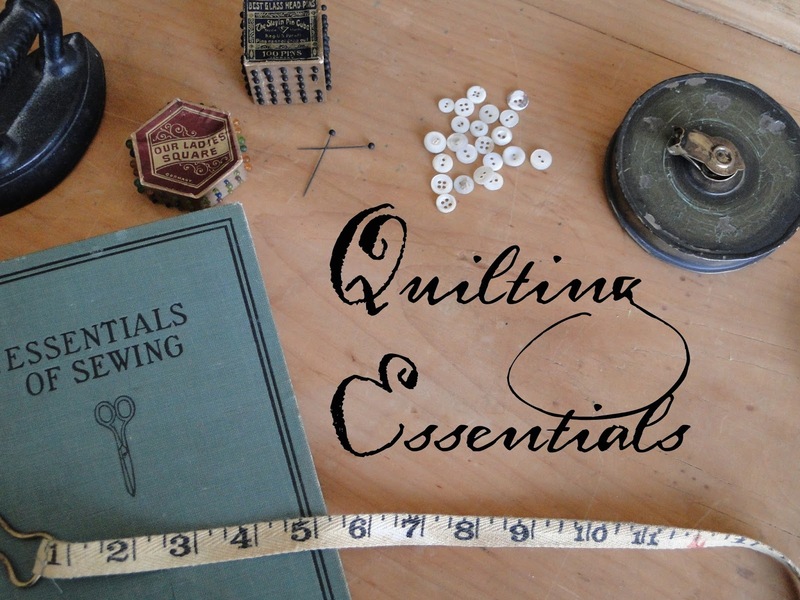 There's a whole lot of designers and quilters who have come to know the benefits of sizing/starching fabric....a lot more than you might think. More on this in a moment. 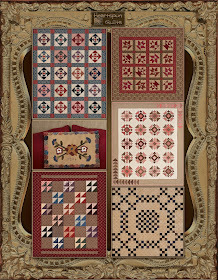 Red fabric being one of the most notorious for bleeding, I did an experiment with this little quilt made from my A Prairie Gathering collection. I sprayed the fabrics with sizing, soaking them thoroughly, then ironed them dry before cutting them for the quilt. If a fabric is going to bleed, it will surely bleed with sizing the same as with plain water. I tossed this quilt into the machine using the same detergent I use to wash our clothes. I wanted to see if any of the reds would bleed into the lights, or onto the backing. I'm happy to report that not one fabric bled. You can see photos of the experiment results in the original post. With today's colorfast dyes, and milling process, fabrics generally do not bleed or run like they did years ago. That does not mean it never happens! If you have any doubt, it's always a good idea to test a patch so you'll know for sure. Why add sizing or starch? Washed and unwashed fabrics are soft and pliable. They fold and bend easily which is not a good thing for piecing. 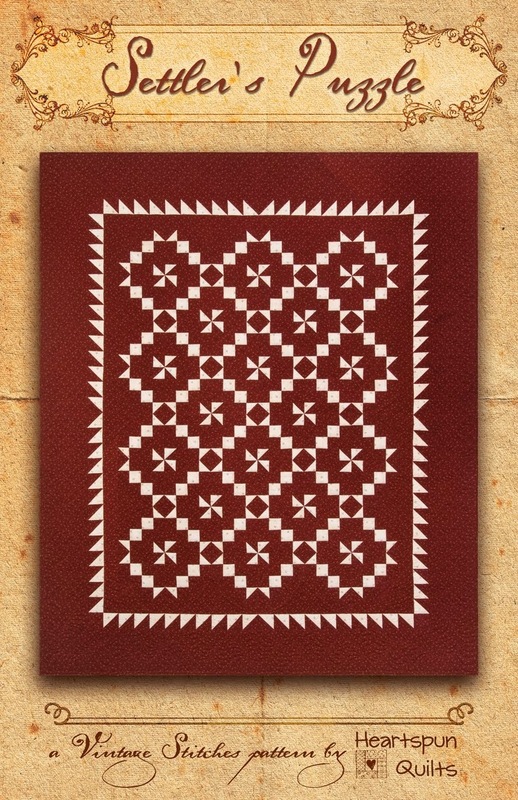 Imagine piecing a block with tissue paper, then imaging piecing with card stock. The stiffer the fabric, the more it behaves, and the more control you have to make it do what you want it to do, stay where you want it to stay, which means controlling it as it moves through the needle on your machine. You must, must remember....starching or sizing must happen when your fabric is still yardage or scrap - BEFORE you cut it up for your quilt!!!! do not spray your cut pieces, or blocks with starch as this will shrink or warp your fabric. I also don't recommend spraying any pre-cut, charm pack, or 10 x 10 pack, to guard against shrinkage. 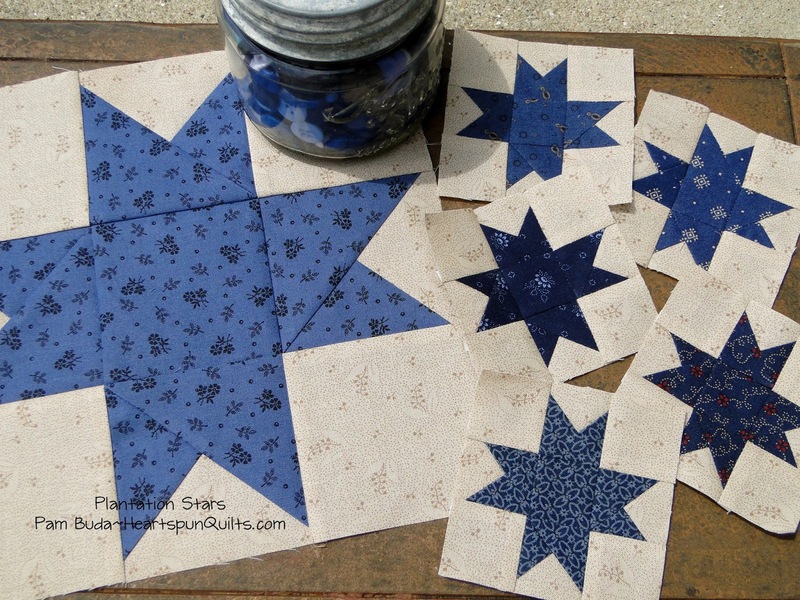 You will notice a difference with the control you have in cutting your fabric, big time with piecing with your fabric, and you'll get a beautiful press with stiff fabric. If you don't believe me, just try it with one block! 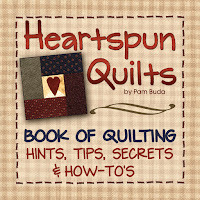 I have an entire chapter all about fabric preparation, sizing, and even a way to starch yardage in your washing machine in my Heartspun Quilts Hint & Tips book. Click here for more info on the Hints Book. All of the above fabric preparation is the way I do things and is just my opinion. 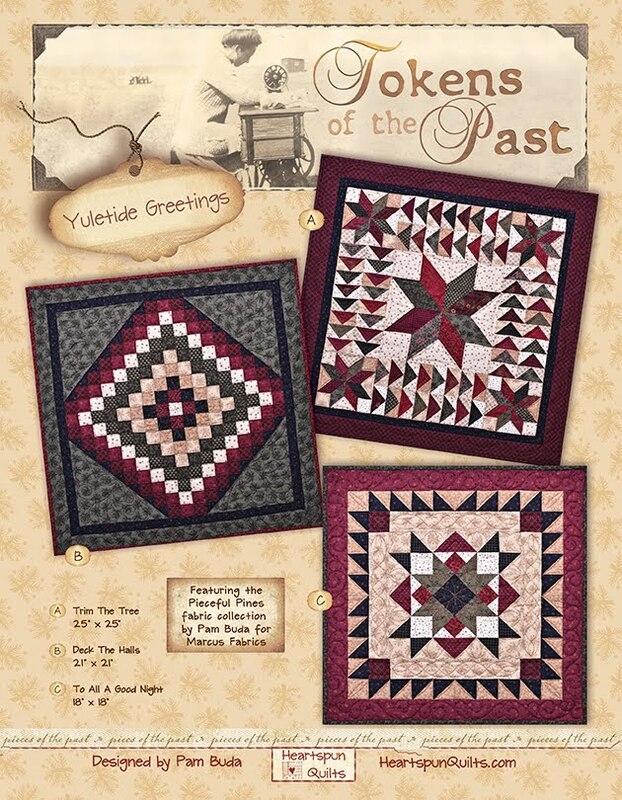 I know it has helped many people gain great results in their piecing experience, but certainly isn't the only way to do things. If what you're doing yields good results for you....if it isn't broken...don't fix it! Wednesday, I am headed to Primitives of the Midwest in Missouri. I haven't traveled for work in a year, so I'm very excited to get back to teaching, meeting wonderful quilters, and making more memories. Check Instagram and Facebook for pictures while I'm on the road. Be well....and keep your sewing machines humming! I'm so, so jazzed that my Plantation Stars quilt top is complete and is ready to be shipped off the my quilter. Yay! Love, love, love how it turned out! I hope you like it, too. 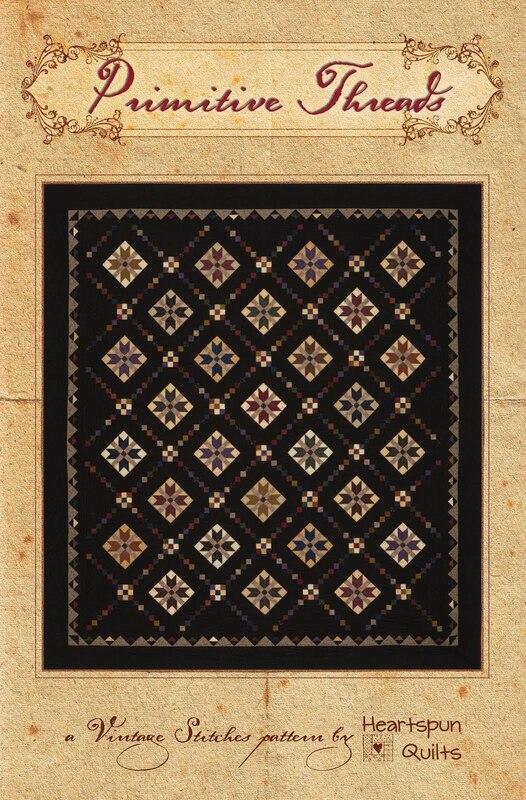 I adore secondary designs in a quilt, and I am so happy that two simple blocks can work together to make such a spectacular design. Don't you love the circle of small stars surrounding the large ones? 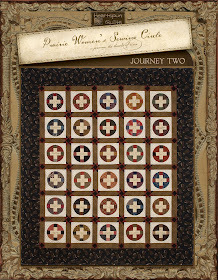 And, as we piece the quilt, at each stage, it's so exciting to see it come together. 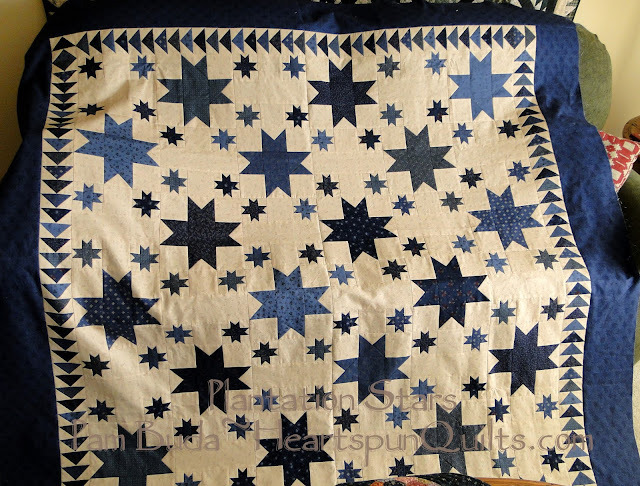 My friend and co-worker, Deb, pieced Plantation Stars for me and did a fantastic job, as I knew she would. Now, it's off to the quilter for the next phase. I can hardly wait to see it completed! 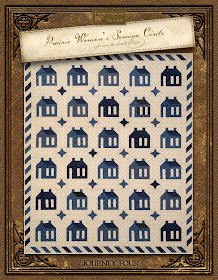 I hope the Plantation Stars pattern will be available in October. And, yes! There will be a limited number of kits, too. 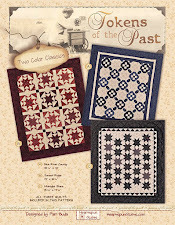 Also in full production is a new Tokens of the Past pattern called Two Color Classics. 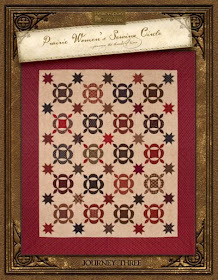 Hint, hint as to what the three quilts will look like! With the help my dear friend, Karen S., I took my first leap into hand quilting over the weekend. So far, as you would expect, I'm not that good at it, (no reflection on Karen's tutorial!!) but I'm loving it nonetheless. 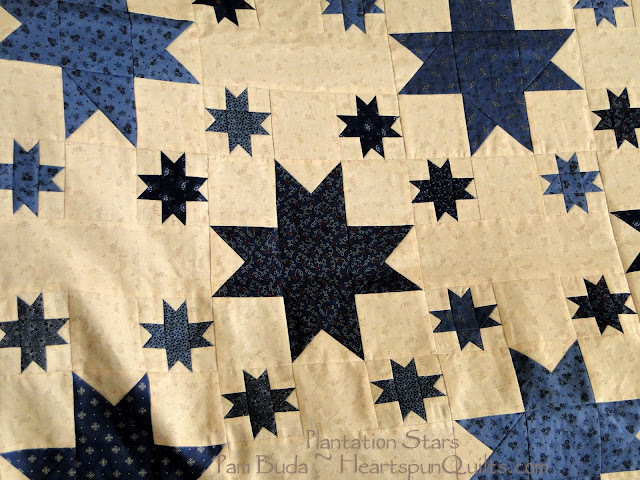 There will never be a substitution for hand quilting, in my humble opinion, and while I won't be hand quilting a large quilt like Plantation Stars, some small quilts just need those hand quilted stitches. 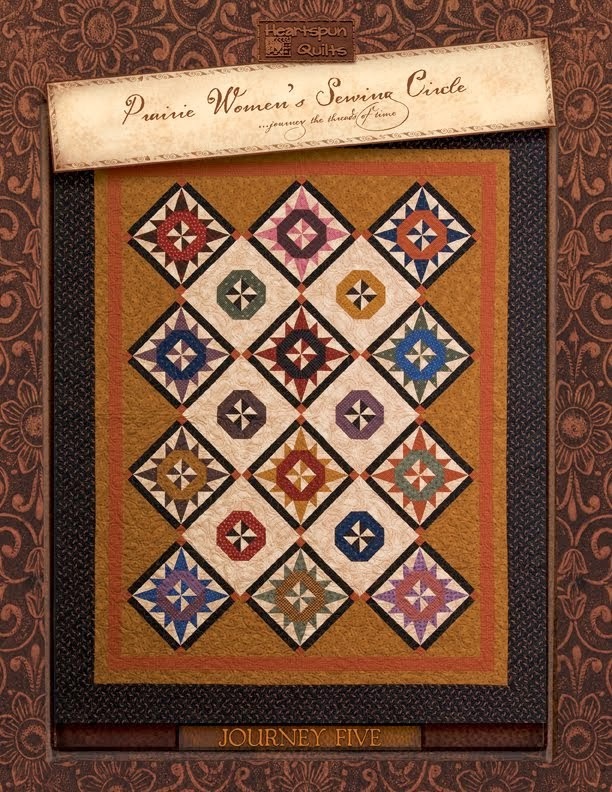 I always try to learn a new quilting skill each year. Last year was hand piecing (totally smitten) and this year, it's hand quilting. Be well....and keep your needles busy! While I am working away on my secret project, my dear friend and co-worker, Deb, has been merrily working at piecing the blocks for my new design, Plantation Stars. Here's a little sneak peek at the blocks. 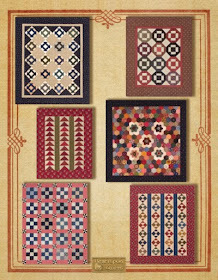 These are the fabrics I chose for the quilt. 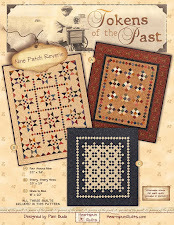 A limited number of kits will be available and the pattern will be ready in October. 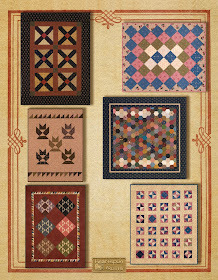 I hope to have a bunch of new quilt patterns for fall market....but....we'll see! Don't we all have a grand To-Do list?! Thought I'd remind you of my upcoming Civil War Quilting Cruise hosted by Deb Luttrell and Stitchin' Heaven quilt shop. 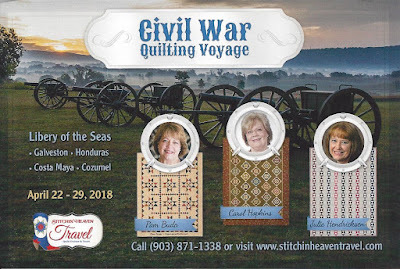 Designer friends Carol Hopkins of Carol Hopkins Designs and Julie Hendricksen of JJ Stitches Quilt Shop are joining me on our cruising adventure! Two awesome CW ladies to be sure....not to mention great teachers. Click here to see a short video about the cruise. Click here for cruise details. Hope you're finding time to sew everyday. I've actually been a very active piecer, both during the day and in the evening lately. Needle in hand means happy me!